Special thanks to Johnnie, to Alicia, and to Pat, whose many corrections and suggestions proved invaluable. Responsibility for all remaining errors is, of course, entirely mine. Hilaire Beloc quote ("Whatever happens we have got") from The Modern Traveller, VI (1898). Project A-Ko quote ("You can be anything you want to--") from Follow Your Dream: Words and music by Joey Carbone and Richie Zito. © 1985 Sixty Ninth Street Music (BMI). Unfortunately, with ebooks rapidly growing in popularity it's impossible to miss the dollar signs in the eyes of the publishing majors, as they at last see a perfectly legal way to freeze libraries out of the picture altogether. However, self-publishing through a print-on-demand publisher enables me to retain all rights, including that of posting the complete book here as well. So you can consider this a blow for freedom, or an act of self-aggrandizement, or whatever else suits you. 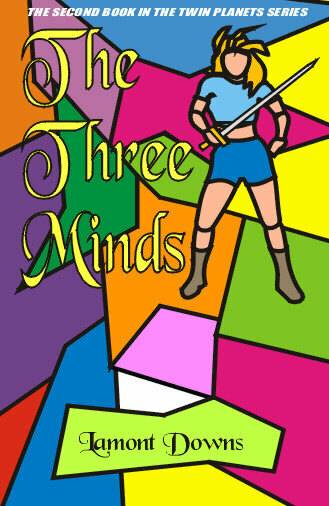 THE THREE MINDS. Copyright © 1998, 2000, 2001 Lamont Downs. All rights reserved. No part of this work may be reproduced, stored in a retrieval system, or transmitted by any means, electronic, mechanical, photocopying, recording, or otherwise, without written permission from the author, except in the case of printing personal copies for non-profit personal use or brief quotations embodied in critical articles or reviews.